Roses have long been used as garnishes and centerpieces because of their elegant colors and delicate texture. While roses are certainly a lovely decoration for the dining room, we encourage you to invite them into your kitchen as well. Every variety of rose is edible, and each one offers a uniquely sweet and floral flavor. Rose petals resemble flavors of green apples and strawberries, with a soft scent that’s a perfect addition to aromatic dishes. Incorporating roses and other flowers into your favorite meals adds a surprising and delicate flavor you’re sure to love. Any variety of rose can be used in cooking, but some will have a more distinct flavor than others. A more fragrant rose will generally be more flavorful, so follow your nose when selecting roses for cooking. Damask roses are a powerfully fragrant variety that has been used for centuries to make rose water and rose-scented oils. Garden roses, heirloom roses, Rosa Rugosa and “The Generous Gardener” are also lovely varieties for cooking. However, you won’t go wrong with any pink oryellow rose variety, and some white roses are delicious as well. Red roses tend to have very little flavor or fragrance, so save those for your centerpiece. No matter what color or variety you choose, make sure to avoid roses that have been treated with pesticides or any other chemicals, as eating them can make you sick. If you’re picking wild roses or roses from your own garden, remember that the best time to pick them is in the mid-morning. You want to harvest your roses after the morning dew has disappeared but before the heat of the day. Before cooking with your rose petals, clip off the small white portion at the bottom of each flower petal. This part has a bitter taste that may not complement your dish. Gently wash your rose petals and lay them on a dish towel to dry. If your recipe calls for fresh rose petals, you’ll want to use them within two hours of removing them from the flower. You may also store your rose petals in a refrigerator for up to a week to prevent them from wilting. When drying rose petals, you can use a dehydrator or simply lay them out in the sun on a dry day. Dried rose petals should be stored in a sealed glass jar and kept out of the sun. Rose hips can also be used in cooking, particularly as an herbal remedy. Rose hips are the fruit of the rose that’s shaped like a rounded, burnished knob. You can harvest a rose hip by plucking the fruit off of the rose bush after the petals have fallen in autumn. Rose hips tend to be the sweetest when picked after the first frost. Commonly used dried, rose hips contain vitamin C and can be steeped to make rose tea. Rose hips can also be made into jams or infused in floral vinaigrette. While many people are not familiar with rose petals as a cooking ingredient, they’re fairly common in Middle Eastern cuisine as well as some Indian dishes. Turkish delight is a familiar example of a rose-flavored food. The North African spice mix ras el hanout incorporates dried rose petals as well as other savory spices like coriander, cumin, turmeric, pepper, clove and cinnamon. Spice mixes with rose can make an excellent dry rub for poultry, lamb and other meats. In western culture, roses are more often used in desserts and other sweet dishes. Rose pairs well with honey, dried apricots and saffron as well as summer fruits like strawberries and raspberries. Rose tea: Dried rose petals or rose hips can be steeped in hot water to make delicate rose tea. Rose-infused beverages: Rose petals can add a subtle floral taste to lemonades, juices and iced tea. Simply muddle fresh rose petals to release the flavor, and stir them into a cool, fruity beverage. Rose petals can also be frozen into ice cubes for a beautiful and delicious punch. Rose simple syrup: Mix equal parts sugar and water in a saucepan and bring it to a boil. Stir continuously until the sugar is completely dissolved. Reduce to a simmer and stir in dried or fresh rose petals. Remove the mixture from the heat and let it steep for about 10 minutes. Strain out the rose petals with a fine sifter, and allow the syrup to cool. Rose simple syrup is delicious in cocktails, tea and lemonade. Rose sugar: Chop up one-half cup of rose petals and mix them with two cups of sugar. Pour the sugar into a covered tin and store it in a cool, dark location for about one week. Sift the sugar through a sieve into a clean glass jar to remove the petals. A few of them can remain. This floral sugar is perfect for tea or to sprinkle on top of sugar cookies. Candied flower petals: Candied flower petals are perfect as an edible garnish for cakes and desserts or simply a sugary after-dinner treat. This recipe can be made with roses or any other edible flower. Paint each petal or flower with gently beaten egg whites, then dip it in granulated sugar. Lay the petals on wax paper to dry until hardened. Salads with rose: Fresh rose petals make a great addition to fruit salads and mixed greens salads. Create a salad filled with other herbs and flowers from your garden for a refreshing summer lunch. Dried rose in granola: Add dried rose petals to a sweet granola mix with dried cranberries, apricots and honey. This floral granola pairs well with vanilla yogurt or can be eaten plain as a healthy snack. Rose butter: Chop up fragrant rose petals and mix them into softened butter. Pack the butter into a ramekin and chill until it’s ready to serve. You can also add finely ground sugar or almond extract for extra sweetness. This delicate butter is perfect served on biscuits, crackers or fruity muffins. Rose water: Rose-infused water offers a great way to incorporate the flavor of rose into an entire dish, such as a custard, sponge cake or other baked goods. Rose water can also be added to beverages or used as a perfume or toner. Spritzing rose water on your face and neck will refresh and tighten your skin. When cooking with roses, be sure to incorporate them in moderation. You’ll enjoy the delicate, fruity flavor of roses more when it’s not overpowering but allowed to complement the food or beverage. The possibilities for cooking with roses are almost as endless as your culinary imagination. Add roses to your salads or dry them and blend them with your favorite spices. While we encourage you to experiment with roses in your cooking, here are a few of our favorite recipes to get you started. A perfect addition to afternoon teatime, rose petal jam is a classic rose dish. Enjoy this light floral jam on biscuits, cookies or sweet crackers. Our recipe is a modern adaptation that’s simple to prepare and yields about four cups of jam. Add sugar and rose petals and stir until the sugar is dissolved. Lower the heat and simmer the mixture for 20 minutes. Increase the heat to a full boil and add the powdered pectin. Turn off the burner and mix in the lemon juice. Skim off any foam that forms. Pour the liquid into sterilized canning jars and seal them tightly. For a more traditional rose petal jam, you can prepare the old eastern version called “gulkand.” Gulkand originated from the Indian subcontinent and is made with pink rose petals and sugar. Simply take equal parts rose petals and superfine granulated white sugar and layer them in a large glass jar. Seal the jar tightly and place it in a sunny window. Allow the mixture to ferment for up to 10 days, producing a dark and creamy mixture. Spread this rose jam on toast or enjoy it with cereal. Clip and wash your pink rose petals. Place rose petals in a large saucepan and cover them with distilled water. You want just enough water to cover them, or the rose water will be too diluted. Bring the mixture to a simmer over medium to low heat and cover it. Allow it to simmer for 20 to 30 minutes. The petals will lose their color and become a pale pink. Strain the petals from the water, and store your rose-infused water in a glass jar. This light and moist layered cake is a perfect summertime dessert. Its sugary and floral sweetness is balanced by tart raspberries, making it almost too easy to enjoy. Preheat your oven to 360 degrees Fahrenheit. Lightly grease two round, eight-inch cake pans with butter and line them with parchment paper. Beat the butter and golden caster sugar together in a large mixing bowl. Once the mixture is fluffy and pale yellow, add the beaten eggs slowly while scraping the sides of the bowl. Mix in the vanilla extract and half of the flour mixture. Add the rest of the flour mixture and fold it into the batter gently. Divide the batter evenly into the cake tins. Let the cakes cool for 10 minutes before removing them from the tins. Place them on a wire rack to cool completely before icing. While they’re cooling, you can make your filling and icing. In a medium mixing bowl, whisk the heavy cream to form soft peaks. Add one teaspoon of rose water slowly as you whisk. Gently fold in the raspberry jam. To achieve a light and fluffy texture, be sure not to over-mix. To make the rose icing, simply mix the confectioners sugar, 1/2 teaspoon rose water and two tablespoons of water. You may also add freeze-dried raspberry powder or food coloring for a brighter shade of pink. Place one sponge cake on a serving plate and generously spread the cream filling on top. You may add all of the filling to the middle or save some for the top layer as well. Scatter your fresh raspberries or sliced strawberries on top of the cream. You may want to lightly crush the raspberries first to release the juices. Add the remaining cream filling and drizzle the icing on top. Garnish your sponge cake with extra raspberries and rose petals. Panna cotta is a smooth and creamy Italian dessert made of sweet cream. This molded gelatin can be infused with a variety of flavors like vanilla, cinnamon, coffee or rum. Plain panna cotta can also be served with fruit compotes or drizzled with chocolate or caramel. Our rose petal panna cotta is infused with rose water for a delicate floral flavor. You can serve this decadent dessert with your favorite berries or cover it with edible flowers from your garden. In a small saucepan, add two tablespoons of cold water and sprinkle the gelatin in. Let the mixture stand for one minute to soften the gelatin. Heat the gelatin mixture on low until all of the gelatin dissolves. Remove the pan from heat and set it aside for later. In a large saucepan, add the half-and-half, heavy cream and sugar. Over medium-to-high heat, bring it to just boiling while stirring. Remove the pan from heat and stir in the rose water and the gelatin mixture. Allow it to cool to room temperature before chilling it in the fridge for at least four hours. When you’re ready to serve your rose petal panna cotta, you can simply top the ramekins with your garnishes or transfer their contents to serving plates. To remove your panna cotta from the mold, dip two-thirds of the ramekin into hot water and then turn it upside down over the plate. If your panna cotta sticks, you can try running a thin knife around the edge. These rose petal desserts are sure to impress your most cultured friends with their delicate and sweet flavors. Roses add a natural elegance to any dish, and their fragrant aroma creates a unique culinary experience. Because of their strong aroma and sweet flavor, roses are a favorite flower for cooking. But the flower world is full of delectable flowers just begging to be brought into your kitchen. Many flowers from common herb plants are edible, including chives, garlic, basil, rosemary, sage, cilantro and dill. The flavor of these flowers typically resembles that of the leaves, but more muted. Other popular edible flowers are those often used in teas, such as hibiscus, lavender and jasmine. In your own backyard, you may find edible flowers like violets, clover, dandelion, day lilies, honeysuckle and pansies. When cooking with flowers, it’s important to remember that not all of them are edible. Check to make sure the flowers you want to use are not poisonous. Read on for a few of our favorite edible flowers and delectable ways to enjoy them this season. These little flowers pack a sweet and crunchy punch and grow in abundance across the Americas, making them an edible flower favorite. Wild violets grow in shady areas and lawns and are recognizable by their rich purple hue. Some wild violets also feature grey, yellow, deep blue or light purple petals. Because of their vibrant color, violets make a great garnish or candied flower. Violets are best eaten raw, with the stems clipped off. Our favorite way to eat violets is to sprinkle them on top of your favorite summer salad or mix them into pasta salad. Fresh violets are a delicious addition to homemade lemonade or can be mixed into sugar just like rose petals. You can also make violet simple syrup for mixed drinks or your favorite summer beverage. Lavender is another versatile flower for cooking. We love the herbal and woodsy flavor of lavender for teas and beverages. It’s very aromatic, with a scent that’s reminiscent of vanilla. Lavender is often eaten dried and ground, as it can become overpowering in a dish. In the French spice mix Herbes de Provence, lavender is mixed with other potent spices like thyme, rosemary, marjoram and oregano. This zesty spice mix pairs nicely with grilled foods and meats. Lavender pairs particularly well with the bitterness of lemon, making it a great addition to lemonade, lemon cake, lemon tarts and lemon bars. Experiment with dried lavender powder in your favorite baked goods, or whisk it into icing for a floral hint. Due to their large size and subtle flavor, zucchini and squash flowers provide a unique culinary opportunity. Squash blossoms can be stuffed with soft cheeses and salty meats for a mouthwatering summer meal. Zucchini flowers should be harvested in the morning when they’ve just opened, and they should be cooked the same day. To prepare zucchini flowers for cooking, remove the stamen and trim the stems. To make stuffed zucchini flowers, fill the prepared blossoms with a mixture of soft cheese, such as goat cheese or ricotta, and spices like chives, thyme, mint or black pepper. You can also add salty cured meats like prosciutto or soppressata. Coat your zucchini blossoms in a batter prepared from egg, flour and beer. In a pan of very hot olive oil, fry each blossom until it’s golden brown. Enjoy these tempura zucchini flowers plain or with a drizzle of fresh tomato sauce. 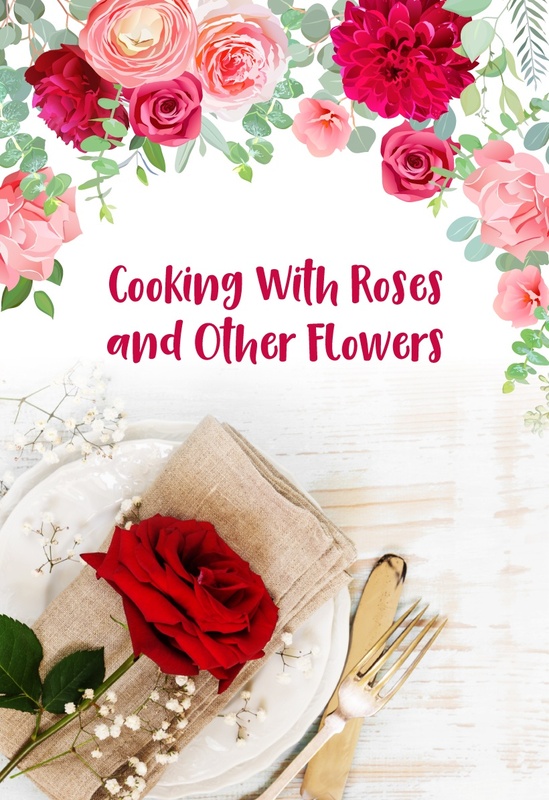 Cooking with roses and other flowers adds a unique floral flair to your favorite dishes and drinks. From rose-infused cocktails to rose petal jam on a delicate biscuit, our edible flower recipes are simple to make and even easier to enjoy. These light dishes are perfect for spring and summertime, but with Ode à la Rose, delicious recipes are always in bloom! Our roses are sources from the best farms in the world and available year-round to be shipped nationwide. Shop our collection of beautiful and elegant roses for your next culinary endeavor or to find a perfect arrangement to complete your dinner table design.